MRS-771 2.1 V.O.C. 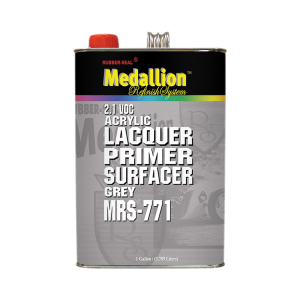 Acrylic Lacquer Primer Surfacer-Grey is a premium acrylic lacquer primer surfacer formulated for the most stringent V.O.C. regulations. This primer surfacer must be reduced with the proper Zero V.O.C. reducer to be compliant. MRS-771 has excellent adhesion with superior filling and sanding properties. For optimum performance a compliant self-etching primer or epoxy primer should be applied to bare substrate before applying MRS-771. Packaged in gallons (4 gallons/case).